yourFXguide-The most interesting thing about this candlestick pattern is its name. Whoever named this pattern did it nicely "Abandoned Baby Pattern". Abandoned baby bottom candlesticks pattern composed of three candles one big bearish candle, one big bullish candle and a doji. Literally, the doji is the abandoned baby. An ideal abandoned baby pattern has gap between the doji and the two big candles. 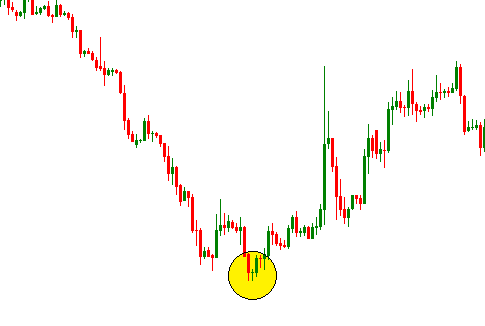 An abandoned baby bottom candlestick pattern indicates the reversal of a bearish trend. The problem with this candlestick pattern is that it can be very hardly found in ideal form on candlestick charts. I searched a lot to find this pattern in ideal form on candlestick chart, but unfortunately I did not find any of them. You may be thinking, if the pattern is hardly found on price chart, why are we learning about the pattern? Thought the pattern is not found in ideal form but the pattern can be found very close to ideal form. Very commonly, you can find the three candles of the abandoned baby bottom candlestick pattern on price chart, only the gap between the doji and big candles can be hardly found. 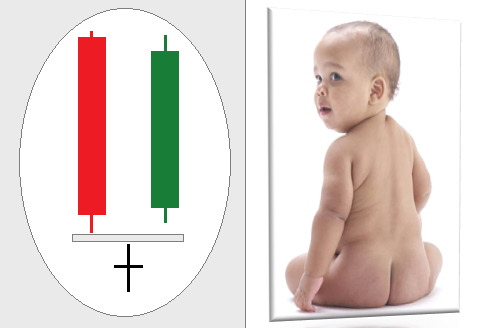 In the above illustration you can find an abandoned baby bottom candlestick chart pattern without the gap. Let me tell you that abandoned baby bottom without the gap is also called morning doji star. Abandoned baby bottom candlestick pattern can be found on the charts of any time frames but the longer the time frame of the chart the higher the reliability of the pattern. Not only this but we can measure the reliability of a candlestick chart pattern in so many different ways. Generally, if the abandoned baby bottom candlestick chart pattern is formed at any strong support level, we consider the pattern as a reliable one. The support level can be a previous low, a fibonacci retracement level, a trend line or a pivot level. We can also measure the reliability of an abandoned baby bottom candlestick pattern with technical indicators. For example, if the pattern is formed at the lower band of bollinger band or fibonacci bollinger band, the pattern is said to be reliable. Even if the pattern is formed when a bearish convergence in technical indicator takes place, we can consider the pattern as reliable. 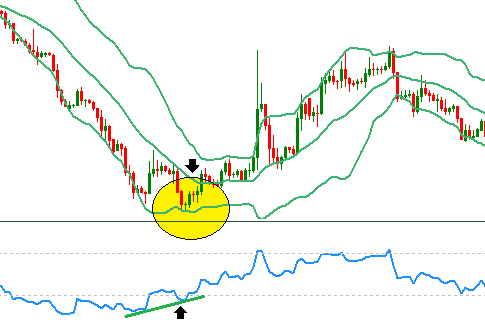 In the above candlestick chart we can see the pattern is formed when the price is kissing the lower band of the bollinger band and RSI is showing bearish convergence. WOW !!! This is really one of the ideal situations to go long on a currency pair with abandoned baby bottom candlestick pattern. It is nice to know about Forex Trading. I read your post till last. It is very well written and your described everything in very clear & simple language.